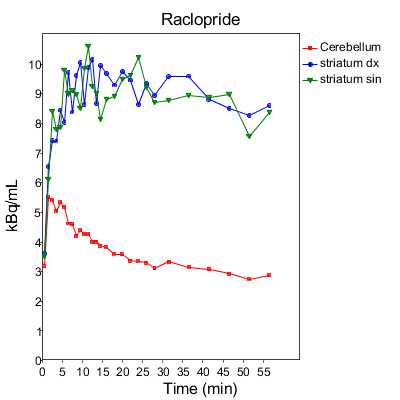 Dynamic PET images contain the concentration of radioactivity as a function of time (“time-activity curve”, TAC) from each image voxel. Volumes-of-interest (VOI) can be drawn on anatomically or functionally interesting tissue regions in the image. Voxels inside each VOI are averaged, and the mean tissue activity curves (TTACs) of each region are saved in file. TACs of individual voxels are noisy, and the amount of data is huge. Due to the lower noise level more detailed models can be used with regional mean TACs. Dynamics and quality of tissue data and model fits can be easily plotted from regional TAC files. Because of the ASCII text file format and small size of the regional TAC files, data is easy to import to spreadsheet programs for further analysis, and simple tools for TAC processing can be quickly made. Even if analysis model is applied in voxel level, producing parametric images, the calculation model may require that reference region is first drawn and its TAC saved in file to be used as input function. There is no standard format for regional PET time-activity files. Data is usually stored in simple ASCII text file formats, usually with PET frame times as the first column, and the radioactivity concentrations in each region as the following columns. File contains also information on the names of the tissue regions and the concentration and time units. As an example, the regional TACs of cerebellum and right and left striatum in a [11C]Raclopride PET study, plotted from the data file, given below (in PMOD TAC format).